Understanding the relative size of every character and prop is important for maintaining consistency and structure throughout your project. A production may contain many characters and props. It is not unusual for these to have been created by different people. If there is no size control implemented, the characters and elements created by different artists can vary greatly in size. When this occurs, the characters that are put together in a scene will be out of proportion. 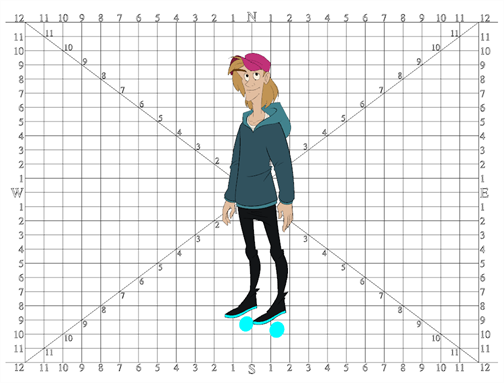 The animator or person doing the scene setup will then have to scale them to the correct size. When a character or a prop is scaled down, the outline will get increasingly thinner. By the time the element is scaled to its proper size, the outline may be so thin that the difference between one character's outline and another's will not look very good. A line up consists of copying and pasting all of your character designs into the same drawing and then scaling them so they are in proportion with each other. This line up is very important and should be handed to any animator, layout and posing artist, or scene setup person working on the project. For the prop design, it is recommended that you paste one of the main character's hands or even the full body beside the prop. This enables the animator to know what size to draw or set the prop. In your character design scene, it is a good idea to create a layer for the character line up. 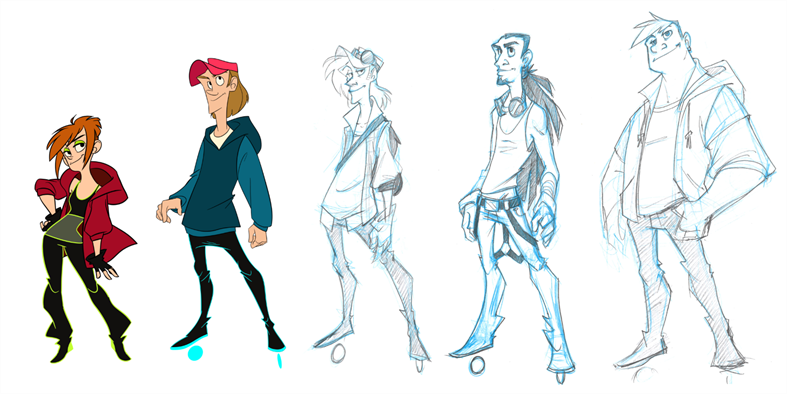 The line up is usually done during the character design step. When the character builder imports the model to the break down scene, the size relation should be correct. The field chart in Harmony is a tool that is very useful when setting the height of characters and props. You can display the field chart using the Show Grid option in the Camera and Drawing views. ‣ From the top menu, select View > Grid > Show Grid. ‣ Press Ctrl + ' (Windows/Linux) or ⌘ + ' (macOS). ‣ Click the Show Grid button in the Camera View and Drawing View toolbars. There are a variety of pens and brushes in Harmony and you can also create and save your own. It is a good idea to create and save pens with precise sizes and parameters to trace and design your models and break downs—see About the Brush Tool.